I'm Desperate - None Of My Magic Spells Are Working! What's Going Wrong? I keep getting "desperate help" messages and people asking "Why doesn't magic work for me? I'm desperate! What's going wrong! None of my spells are working!!!" There is a really simple answer to this that is so, so important in magic, but so few people seem to know about this. Here is in a nutshell what happens when when your spells don't work, why they don't work, and most importantly, what you need to do to get your magic power up and running as it should. First, watch this quick video about your energy body and the effects of stress on your energy body. Next, check out the Stress Chart and choose where you are most of the time. Every person can be anywhere on this scale, depending on how stressed they are at the time. WHATEVER you want to do in life, AND INCLUDING MAGIC, needs you to at least be on the positive side of the energy body stress table in order to succeed. People turn to magic spells and potions out of desperation, stress and because they don't know what else to do. 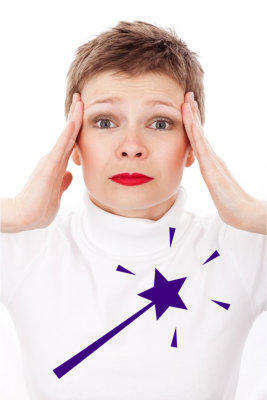 As a result, there are a great many people trying to cast spells when they are stressed - low on energy. MAGIC NEEDS ENERGY TO WORK. It needs powerful, fast flowing, free flowing energy and that's exactly the same as driving a car well, or being a good parent, or cooking a decent dinner, or doing a good job at work. If you are stressed or desperate, you need to STOP and do something positive and uplifting FIRST to put you into a place of POWER. Here's what to do in brief. First, check where you are right now on the stress chart. If you are feeling low, negative, desperate, freaked out, STOP. In practice this means focusing your mind on something that is STRONGLY POSITIVE to you. A loved one, an animal, a landscape, a future dream - the important thing is that you should find something to love. Notice how when you start thinking of the things YOU LOVE, you become first of all calmer, and how the feelings in your body start to change. Do not attempt to cast any spells unless you are AT LEAST on a +3 - EVER. The only exception to this rule is to do rituals of supplication, where you are essentially just throwing yourself to the floor and begging angels, deities or "friends" for their help and support. The fact is that nothing good comes of spells and rituals cast by a person with low energy. All it does is "bites you in the backside" as you're trying to raise energy that you don't have and leads to all manner of unhappiness and weirdness. Indeed, it is my supposition that it is this futile attempts at low energy magic that has given magic a bad name over the millennia. Raising your energy levels isn't difficult; it just takes practice and the will to turn away from negative things for a moment and make that mental/energetic move towards something beautiful, beloved, inspiring. Indeed, learning to raise your energy levels is the key to so much more than "just" making magic work. It's the key to making LIFE work as it should. I can't recommend highly enough that you seriously start paying attention to your energy flow as it changes from moment to moment; to begin to recognise when you're getting "low on life fuel" and starting to think negative thoughts about yourself, other people, your future and your past and to TAKE ACTION to get back into the positives. There are many ways to do that; find things you find inspiring and attractive and USE THEM to give you a boost when you need it. Certainly, before any magic ritual or attempting to cast any type of magic spell, make sure your energy is high and your power is on. That's when spells stop misfiring and will really start to work for you. "If you fill your mind to overflowing with beautiful things, there can be no room left for doubt." An easy (and very cheap!) way to learn to raise energy reliably here.